Flow through me, greatest foe! Know that I will defeat you! Parody of: Metal Gear Rising Revengeance - Rules of Nature. Contains some lyrics from Magic by Lauren G.
Here's a Great and Powerful mare! 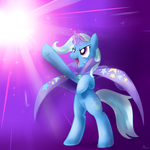 Only the Great And Powerful survive! For you all to enjoy! And you know everyone's got that one thing that makes them happy will for is making our dreams come true and always stick together as a team. And like you said "friendship is magic"
We Orcs respect strenght and Strenght alone!